Are we looking at iPhone’s map of the future? Today, the U.S. Patent and Trade Office (USPTO) published an application from Apple(s aapl) that details the workings of an “Interactive Map” with many layers, according to Apple Insider. The map itself is a program that allows users to view different “layers” of content, pulled from the Internet, over the map. In the report, Apple gives the example of a weather layer that could tell users when a storm is approaching. Other sample layers include Shopping, Commuting, and even Tourism. The map is also designed to take into account these layers when the user searches in the area, to provide further context for searching. For example, someone in the Shopping layer who types in “skateboard” is more likely to get a skate shop than a skate park. The layers would also have some geospatial features — users in the “Tourism” layer could get access to information for all the landmarks in the immediate area. 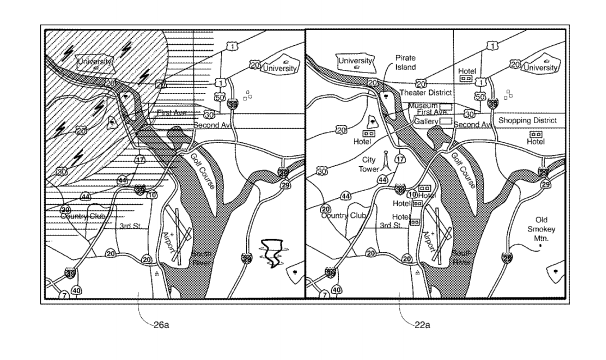 The patent also discusses the maps’ interactivity. The application describes the ability to tap on specific features or landmarks to get information, like the population of a city or the year a landmark was built. Touching two points on the map would create a route between them, like a more sophisticated pin drop. Pins themselves would also receive an overhaul, with more robust features, instead of being phased out entirely. Apple has been in pursuit of a better Maps program since the Cupertino company had a fall-out with Google(s goog) in 2012. But the implementation of a proprietary Maps system has been a thorn in the giant’s paw, so to speak — providing the most headaches for users with its bad directions and glitchy behavior. While necessary updates like transit directions are likely in the works, it’s promising to see that Apple is actually looking further ahead to bring a more enriched experience to the app. It might be a long while before the company has a Maps app worth using, but this patent could be a promising first step. Hi Lauren- your headline and some phrases in your article are misleading. Apple has not yet patented this interactive map- they have merely filed a patent application. The patent application has been published, but it has not yet been patented. And even if there was no patent for this, there is no prior art? Layering internet information on maps has been around for years but with Apple you would think they invented all of this.